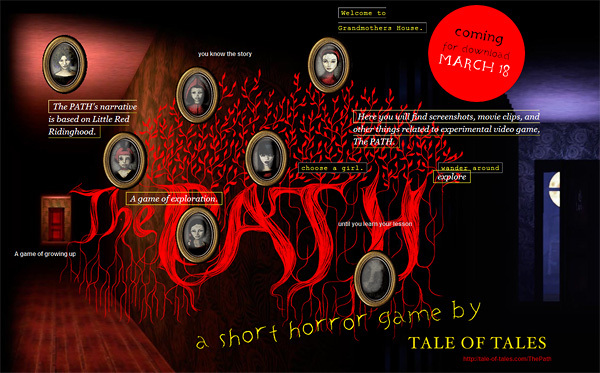 The Path will be released on 18 March 2009, exactly ten years after Auriea and I met in person for the first time and launched our first collaborative project. We are planning to repeat this event in one month from a room in the exact same hotel in San Francisco, with The Path. There will be no witnesses. with a personal page for every Red Girl, screenshots, videograbs and quotes from the game and pictures of the creators as teenagers!!! I believe I started to hyperventilate when I read that. Thank you so much for telling the release date! I simply can’t wait until I can play it. Also, I like the new website very much. I believe I may have found Scarlet’s wolf there. I’ve been wondering how he looks. on Steam! That’s fantastic! I hope that gets you all even more publicity! Great news!! I am really looking forward to this. Very impressed to see you bring this through to completion. I just jizzed in my pants. Most excellent! I hope you have some idea of how much I am looking forward to playing this. I don’t have very many opportunities to experience things that make me as deeply afraid or wary as I feel like this might. One of my favorite things in making art and experiencing the art of others is confronting and trying to defeat the fear that is brought on by the subject matter or the feelings it provokes. I am so pumped. Wow. I clicked and clicked, and still haven’t found a photo of teenage Michaёl. But young Auriea is adorable, and the site is just a right mix of joy and mystery. Now that there’s more material, I’ll start talking about it on the french sites. I know a big community waiting for this kind of emotional experience, since the emotional power of this medium is a subject that comes back a lot on this site. That’s nice. We have some teaser videos that you can share. And we’ll have more stuff later. or maybe you didnt,.. maybe its because you dont even know who i am,.. The Stagleaf blog’s colors have been changed to celebrate this event. A double congratulations on getting signed up on Steam. Out of interest how different was their reaction to The Path as opposed to 8? I remember you writing about 8 and they either didn’t reply or palmed you off. Secondly are they (Steam) going to stand behind the game at all and promote it, or adopt a “let it sell itself” approach? We hadn’t approached Steam with 8 at all. But it was in that period that we met and befriended Greg Coomer, who is still our champion at Valve. We’ve been in touch with them concerning The Path from early in the production but they couldn’t (or wouldn’t) make a commitment until the game was done. I think they realize that they will need to promote The Path a bit for it to do well. All in all, Direct2Drive has actually been a lot more supportive and helpful in terms of promotion than Steam, so far. But of course the Steam audience in many times bigger. That sort of information is indeed considered confidential according to our agreement. But we would like to share it because we know it’s very helpful for other independent developers. So when the time comes, we’ll ask special permission. Hehe, I doubt they would mind you telling us to use the download-ee in question. After all, they’ll get more purchases off it.